World premier recording of the Authentic Yale Edition. 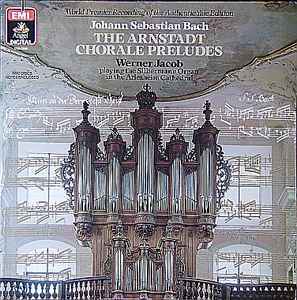 Side D, Preludes & Fugues (BWV.553-60) is attributed to J.S. Bach (Spitta's old complete Bach edition) but were probably composed by Bach's pupil J.T. Krebs or even his son J.L. Krebs. Digital recording, played on the Silbermann organ in the Arlesheim cathedral.